In 1993, the city’s historical centre was rightfully added to the UNESCO List of World Cultural Heritage. 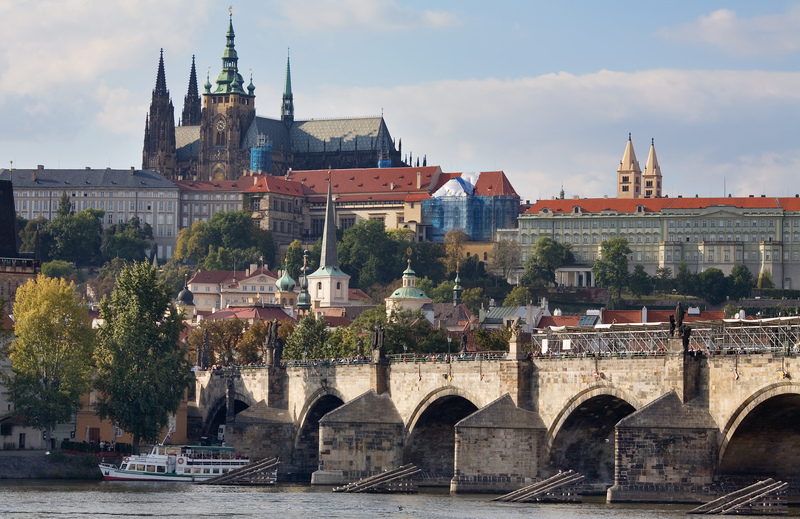 For lovers of historical monuments, Prague is, literally, a paradise. The grand Baroque palaces of the Hradčany quarter join forces to form a monumental gateway to Prague Castle, with its magnificent Gothic cathedral consecrated to St Vitus. The Lesser Quarter boasts a profusion of intimate corners and pleasant restaurants; fine burghers houses blend with splendid aristocratic palaces and charming gardens here. The Old Town of Prague offers its visitors a network of twisting medieval lanes and the Old Town Square. When exploring the remains of the former Jewish town, its synagogues, the Old Jewish Cemetery or the extensive collections of the Jewish Museum (one of the most valuable tobe found in Europe), you are certain to experience a mysterious spiritual atmosphere. The Charles Bridge, the most beautiful promenade site in Prague, is alive with street artists and musicians. Prague is a city of very high standards, offering both historical and modern conference venues, hotels, restaurants and places of interest. Prague – the capital of the Czech Republic situated on both banks of the Vltava river is a beautiful city with a rich history. Thanks to its location in the centre of Europe, Prague has always been an important crossroads of trade and culture. In the course of its thousand-year history, Prague has always been the political, cultural, and business centre of the country. Prague belongs to the architecturally unique European towns, attractive for tourists from around the world. Visitors find themselves enjoying a living museum of European architecture from Romanesque time to the present. World Cultural and Natural Heritage area of more than 8 sq km, over 100 theatres, concert halls, galleries etc More than 100 personalities famous world-wide have lived in Prague (e.g. King Charles IV, Rudolph II, J. A. Comenius (Komenský), W. A. Mozart, Franz Kafka, A. Einstein, A. Pick, M. Curie-Sklodowski etc…).